The nature of global business is constantly evolving - new markets emerge and existing opportunities change from year to year. Consequently, so does our work. In developing global business education opportunities in collaboration with faculty, partner business schools, and corporate and non-profit partners, we must ensure that these opportunities we provide for today's students remain relevant and enhance student development, perspective, and leadership upon graduation. This school year, we have added educational experiences in the Middle East, Brazil, Turkey, India, and Costa Rica. We are looking ahead to creating more experiential learning opportunities in Latin America and Africa in the coming years. Just as important as geographic opportunities are our partners. We are continuously reminded of the value of networks to our work. Faculty, alumni, partners, or friends of the Carlson School with experience in a region of the world are invaluable in helping open doors in a new location. We are fortunate that the Carlson School global network is strong and growing. A core value of the Carlson Global Institute's mission is to support and advance these interactive and increasingly global networks. Our January programs included two alumni receptions in China, providing an opportunity for current students to connect with alumni and experience first-hand the value of these global connections. Also, for several programs abroad, students were able to meet with alumni working and living in the host country, like James McGregor in China, author of One Billion Customers. Alumni also participated in student site visits to companies like CH Robinson and Ogilvy Public Relations. We hope you enjoy this issue of Going Global and the stories that illustrate the value of our evolving Carlson School global network. If you have any comments about our newsletter or interest in increasing your engagement with the Carlson Global Institute, please contact Director Jennifer Hawkins at hawki044@umn.edu or 612-624-4334. And to those of you in China, a Happy Year of the Snake to you! D’Angelo also presented data from recent research on the impact of education abroad participation on a range of personal development factors in undergraduate and MBA students. D’Angelo and co-researcher, Associate Dean of Global Initiatives Michael Houston, are exploring the impact of education abroad on students’ motivation. In 2007, Carlson School faculty made the bold decision to integrate international experiences as a key part of the undergraduate and graduate curricula. Findings from these studies will be useful in determining the impact of these curricular changes on student development and global leadership. "The Carlson School has led the nation in preparing its students to creatively address the challenges of global business enterprise,” said Margaret Heisel, former director of NAFSA’s Center for Capacity Building in Study Abroad who supported the benchmarking project. “The models D'Angelo displayed in her CIEE presentation demonstrate how Carlson is engaging its students in problem solving and deep learning, building requisite global skills, and knowledge. She also outlined Carlson's program assessment methods, which have yielded persuasive evidence of learning outcomes. Session attendees found these research outcomes particularly important and useful in light of the current high level of interest in assessment generally in higher education. Look for further information on these findings and other research in our upcoming Going Global issues. Global business panelists from left: Chief Operating Officer-Technology Rick King, Chief Research and Academic Officer Chang Wang, Director of Legal Strategy Tolu Deleye, and General Manager of eBilling Hub Carlos Seoane. Three keys to having a successful global career include perseverance, subject matter expertise, and curiosity. Also, extroversion can be a leadership asset, but an asset in one culture may be a hindrance in another. These insights into managing business globally emerged during a recent visit to Thomson Reuters’ campus in Eagan. The visit was part of Welcome Week for 28 students from partner business schools around the world who will be studying at the Carlson School for spring semester. Their visit to Thomson Reuters included an overview of the company and its global footprint, a description of its operations in Minnesota, and a global business panel moderated by Rick King, chief operating officer for technology. Panelists were Director of Legal Strategy Tolu Deleye, who grew up in Nigeria and the United States; eBilling Hub General Manager Carlos Seoane, a native of Spain who has worked for Thomson Reuters for over 10 years leading global mergers and acquisitions; and Chief Research and Academic Officer Chang Wang, who hails from China. The discussion focused on what it really means to be a global company, how Thomson Reuters approaches business strategy, and how each panelist characterizes the traits of successful leaders. Students gained a stronger understanding of Thomson Reuters as a company and insights into what it means to be a leader within a global business. Students and alumni making connections during the event in Guangzhou. Did you know that Carlson School alumni number over 47,000 and reside in 78 countries and the University’s global alumni network is over 400,000 strong? Alumni networks provide enduring benefits beyond time in the classroom. They can provide meaningful business opportunities, introductions to new cities or cultures, and career connections among other benefits. For the second consecutive year, Carlson Global Institute has collaborated with the Carlson School’s Alumni Relations office, the China Executive MBA team, the University of Minnesota Beijing office, and the University of Minnesota alumni chapter in Shanghai to host alumni events in conjunction with Carlson School student programs traveling to Shanghai and Guangzhou in January. 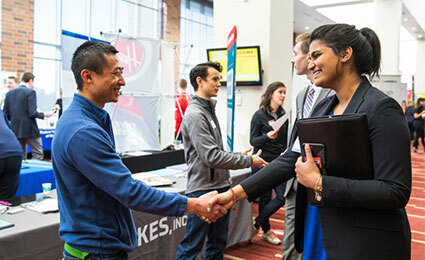 The events provide an opportunity for current Carlson School students and alumni to connect and interact in meaningful ways by establishing new relationships and sharing mutual interests. This year, these events brought together over 150 individuals to celebrate the University’s global network and create relationships of their own. If you are a Carlson School graduate, join the Carlson Global LinkedIn group to connect with other alumni interested in global issues. Cultural immersion through a semester studying abroad is an extraordinary experience for many students. It provides them with a unique opportunity to dive deep into a society, broaden their perspective about their host culture, and develop knowledge and skills through this experiential learning opportunity critically important in today’s global economy. The Carlson Global Institute has exchange relationships with 29 schools in 24 countries. Each year approximately 70 Carlson School students study abroad for a semester or longer and more than 60 students arrive from abroad to study at the Carlson School for a semester or longer. We asked two students, a Carlson School undergraduate who spent a semester in Brazil, and an MBA student from Università Commerciale 'Luigi Bocconi’ in Italy who spent fall semester 2011 at the Carlson School, to share some of what they learned through their exchange experiences. What inspired you to study a semester in the location selected? I wanted to go somewhere that was like nothing I had ever experienced before. I had lived in Minnesota my whole life, and so wanted to go to a place that was totally different and that would challenge me mentally and emotionally every day. How did the experience align with your expectations? The experience was above and beyond my expectations. Not only was I challenged mentally and emotionally every day to grasp the language, the people, school, the culture, and a new way of life, but I also made some of the strongest and most significant friendships that I have ever known. What was your most meaningful experience while abroad? The most meaningful experience to me while in Brazil was interacting with new people every day. Whether they were Brazilians or other exchange students, I gained new and interesting ways to think about life, business, relationships, and almost everything else you can imagine because of our completely different backgrounds and upbringings. I was very fortunate to have a great group of fellow exchangers from all over the world (countries represented included Canada, New Zealand, Germany, Austria, Finland, Norway, Sweden, Russia, Spain, the Netherlands, Mozambique, Bulgaria, Turkey, and more) who got along very well, and the adventures that we went on together were all the more memorable because of our distinct backgrounds. What surprised you most about your time abroad? What surprised me most was how different life is without a smartphone and constant technology. I lost my cellphone that I bought in Brazil and the iPod I brought pretty quick into the trip and so if I left my apartment I had no telecommunications medium at all. It’s actually quite nice and I really enjoyed it. How have you (or will you) bring the knowledge you gained from the semester abroad into your future classroom or work experiences? Well, to start, because of my experience abroad I picked up an international business major. Our curriculum while in Brazil was mainly focused on international business and geopolitics, and I found it extremely interesting and valuable. Especially here in Minneapolis with many companies having their products and services globally sourced and traded I think that an international mindset while conducting business is extremely important. Upon graduation I will be searching for employment that uses this body of thought in its operations, first off because it is - to me - a very interesting field, and secondly because there will be opportunities to travel the world. What inspired you to study a semester at the Carlson School? I was interested in a USA exchange program experience. The Carlson School was one of the best-ranked schools in my university exchange program choices. I was grateful because the USA university life is very different from the one that I had in Italy. It was very good to fit with another school system and understand another university culture. I really loved the possibility to spend Thanksgiving Day with the family of one of your professors. I had the possibility to travel and understand a little bit more about the USA culture. I met very nice and interesting people. It was easy to adapt to this new environment and the people’s availability helping me to do it. I have learned that you can feel good in every part of the world if you find people available to help you. I have learned also that with these types of experiences you learn to face life better. Professor Shaker Zahra, Carlson School faculty member and chair of the Department of Strategic Management and Organization, will be receiving an honorary doctorate from the Stockholm School of Economics in Sweden. The event conferring the honor will take place on Saturday, March 9, in Stockholm City Hall, the usual gathering place for Nobel Prize ceremonies. 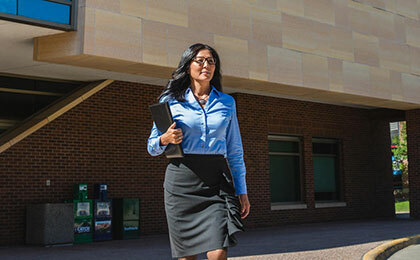 Zahra, also holds the Robert E. Buuck Chair of Entrepreneurship and serves as the academic director of the Gary S. Holmes Center for Entrepreneurship. He also is the founding co-director of the Center for Integrative Leadership at the University. His expertise lies in the areas of corporate entrepreneurship in science and tech-based industries, entrepreneurship and national policy, and innovation. Strategic Management and Organization Professors Myles Shaver and Aks Zaheer were selected as two of the "World's 50 Best Business School Professors" by Poets & Quants. The Poets & Quants listing included professors whom "are not merely great teachers--they are great faculty members, masters in both the classroom and in cutting edge research." In his profile, Shaver said the best part of his job was seeing his students refine and enhance their knowledge of important business issues. Zaheer told Poets & Quants the joy of discovering fresh ideas, and the ineffable joy of exposing students to fresh ideas, new perspectives, new ways of thinking and looking at things is the best part of being a business school professor. March 6-7, 2013, 8:00 a.m.-4:30 p.m. Expand your intercultural communication skills so that you can manage, work, and impact business results more effectively across time, space, culture, and organizations. Improve your global team performance, increase productivity, and reduce opportunity costs. Visit the website for details and to register. Visit nobelpeaceprizeforum.org to learn more about this dynamic global event that brings together Nobel Peace Prize winners, civic leaders, and scholars together with students and other citizens. Guest speakers for 2013 include Muhammad Yunus (2006 Nobel Peace Prize winner), Dr. Paul Farmer (author of Mountains Beyond Mountains), Nina Easton (columnist and senior editor, Fortune), and Tawakkol Karman (2011 Nobel Peace Prize winner). March 28, 2013, 8:00-10:00 a.m.
Visit Minnesota Trade Office's online event calendar or contact the University of Minnesota Center for International Business Education and Research (CIBER) at 612-625-9225 for more information. Indiana University's Center for International Business Education and Research (CIBER) invites you to "The Business of Language: Educating the Next Generation of Global Professionals." To register, visit kelley.iu.edu/cblc/register.html. May 14, 2013, 2:30-6:00 p.m. This event is jointly sponsored by CIBER and the Medical Industry Leadership Institute and will explore the healthcare and medical industry market in Brazil. Contact Jennie Meinz at University of Minnesota CIBER at 612-625-9225 for more information. The Carlson Global Institute provides a variety of opportunities for organizations and individuals to engage with us. Opportunities include hosting site visits here and abroad, Global Business Practicum (live case) sponsorships, guest speakers, and financial support for student scholarships, research, and program development. If you are interested in learning more, contact Jennifer Hawkins at 612-624-4334 or hawki044@umn.edu.